I was inspired by our lovely spring landscape to make this new brooch, titled "Minnesota in Spring". I've needled some lovely white Ramboillet wool into this scene, reflecting the splendor out my door. I set it into a base I made of hickory wood. Here you can see it against the landscape that inspired its design. Even my children have been finding inspiration, and my youngest boy just completed this painting he's called "Drift". I think he did a great job. He even has the scale down perfectly. I kid, of course. I do think I'm in the throes of cabin fever. Hope you're having a lovely weekend, wherever you are. Mother Nature dumped another little gift on us yesterday. Another foot of snow in spots, on top of the pile o' plenty we had already. School is cancelled so you know it's a big deal. School here doesn't close for anything under 8" of snow. But it's been blowing and the roads are ick, so here we are. See that pathetic lump in the right side of the picture? That's my oldest son, flopped down, having a little pity party. (you know it's bad when the kids don't even appreciate a snow day) We're all a little sick of it. Someone forgot to bring the hallway rug in after they swept yesterday. Oops. So while my creative impulses seem buried under this snow too, my need to organize isn't. I'll be trying to get my workspace a little closer to finished. I've got a pot of chili in the crock pot and plans for snow cream tonight. The kids have their paints out and then there's plans for a movie fest in the basement tonight. Not what I had planned for this weekend (a much-anticipated visit has been cancelled) but really now that I've got it all typed out it doesn't look so bad. I hope you all enjoy your Friday and have a great weekend too. I received this lovely stone from Victoria in Hungary. In her note she said that she gathered it from the river Danube where she used to work as a stewardess on a hydrofoil. I knew immediately that water had to play a part in her stone so I mixed up some fibers in watery colors. I added some stitches that spoke to me like ripples, spreading out, occasionally encountering an interruption. I have over 50 stones already but I'd like to add more to the project. If anyone else would like to send a stone to me, I'd love to have them. You can get all the information on this post HERE. Anyway, the mushroom is still hanging in there in the tree. The bit of snow stacked on its cap hides the fact that a good portion of it has been chewed off by some visiting critter. The green wool has started to fade considerably but it doesn't appear that whatever was trying to burrow beneath it has done any more excavating, at least for the time being. Many of the gills are missing, as is the veil. The wool is pulling off in places in long straggly locks. You can see in this photo the transition from fall through winter. It started off standing proud, then something started to nibble on its veil and cap a little, then it started to lean as something dug in its green moss, and finally to its snow-laden state. I love watching this progress. And to wish you all a peaceful weekend. A huuuuge thank you to all of you that stopped by my shop update this morning or who helped spread the word. All of my work has found new homes and I'm thrilled. I'll be busy packing and shipping these out and then I'm thinking about heading to the woods with my snowshoes. Mother Nature so kindly dumped a good 6-8" of new snow on us yesterday. I figure if you can't fight it, you might as well roll with it. 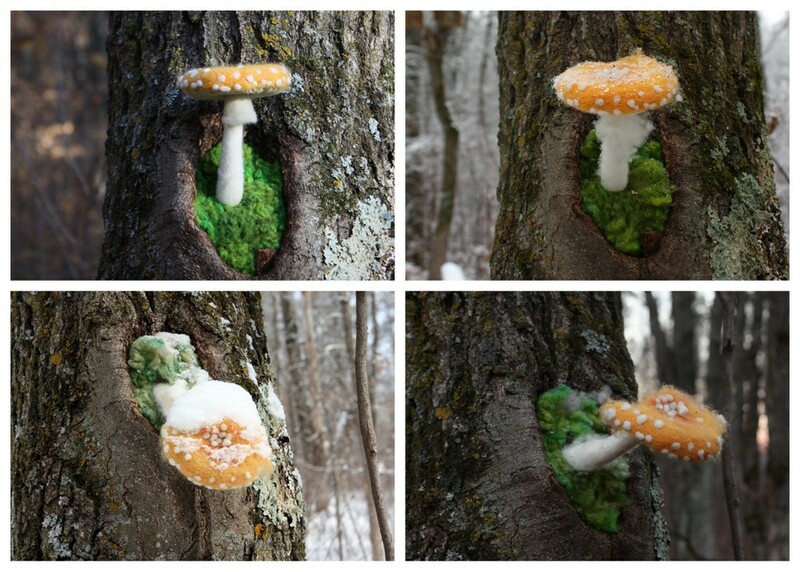 I think I'll go check on my wool mushroom installation and get some fresh air. The glass is cleaned, the base is finished, and my amethyst mushrooms are finally completed. This is my largest mushroom scene to date, measuring about 14.5" to the top of the glass and 10" wide at the base. This scene is a reflection of the darker corners of the woods. The oft-overlooked little scenes that play out beyond our gaze. The sort of scene you'd have to really look for in order to see it. Mushrooms doing their job, decaying a log beneath the moss. A spider taking advantage of a downed twig to catch its dinner. It seemed fitting that this darker scene have a darker base as well. I took a large chunk of oak and planed it to size. I applied a vinegar and steel wool solution and watched it combine with the tannins in the oak to form a dark finish. Being careful to leave the shape organic and bumpy, I sanded the surface smooth and applied a layer of natural tung oil and local beeswax. This piece, the other small terrariums, some brooches, and my 'Stepping Stones' piece (I know a few of you have asked, and I've decided to sell it) will be in my shop tomorrow morning (Fri, Apr. 12) at 7am, central time. If you'd stop by or spread the word, I'd very much appreciate it. That little mushroom I showed you in yesterday's post has been completed. It was inspired by the bicolor bolete (as clever Karen noticed yesterday), a lovely and edible mushroom. I took a little liberty with the hue (hey, that's an artist's prerogative). I added a slimy little friend, who I adore. I had so much fun making him that I actually giggled while needling him into place. I also added some pebbles and sporophytes in the moss, a signature touch for me. I set this one into a piece of chokecherry from our woods. This one will take me a little while to finish but hopefully I'll have a good start on it by this weekend. I can't wait to show you when it's done.